A photographer, a videographer, an investigative reporter and a design assistant walk into a bar. She sits down and orders a drink. That, my friend, is a bad joke, but a presentation at the annual SPJ Excellence in Journalism conference this past weekend had me feeling like all of those things in one. 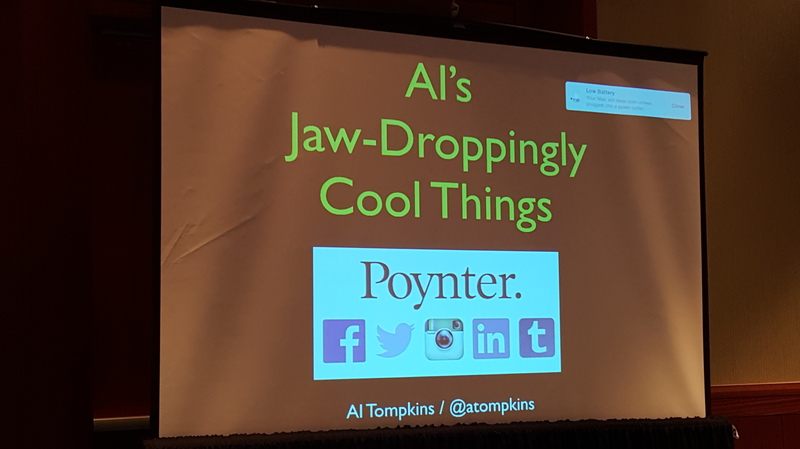 In his hour-long presentation titled “15 Jaw-droppingly Cool Online Tools,” Al Tompkins, of the Poynter Institute, presented seemingly basic technology that we have all longed for, for way too long. It was the type of presentation that makes you want to text your editor (which I did) and say “Holy crap. This is awesome. Learning so much” (which I also did). The best part? All of the tools are free. Of the 15 that Tompkins shared, I’ve chosen a few of my favorites to share with you. If you’re intrigued, keep a look out for a potential future event where we might just share the rest. If you’re not intrigued, please reevaluate. VoiceBase is a free transcription program that will take a variety of different audio files and transcribe it word for word. Tompkins tested it out on an NPR podcast and it was pretty impressive. Although you can’t depend on this for an exact translation—Iraq in the podcast read “a rock” in the text—with the expectation that you need to perform minor editing, this tool could be a huge timesaver. ThingLink takes a still image and gives you the ability to create tags that, once hovered over, have corresponding, customizable information windows. I’ve already used this one myself. The only downfall is that you need to upgrade to have any sort of formatting and style option, but for basic links, titles, or small amounts of information, it works well. Canva is an online site gives even the most beginner of designers (like the people who default to stick figures when asked to draw anything) the ability to create quick graphics, primarily for social media posts, banners and flyers. Google Street View allows users to give their viewers a 360 view of an area. It’s a downloadable app that prompts you to photograph an entire surrounding area and then stitches each image together for you. SPJ needs to be more inclusive to its newcomers. Here’s why.